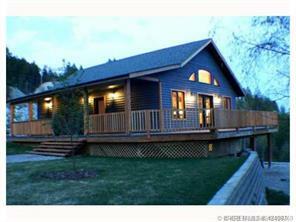 Spectacular home on almost 2 acres plus an additional rental home. This beautifully appointed home has it all, starting with the open living, dining, kitchen, that opens onto the large deck, bringing the outdoors in. In addition the main has two large bedrooms, and spacious bath. The lower is a walkout basement, with full bath two more bedrooms, laundry, and rec room. There is a separate one bed dwelling, that can be a monthly, or nightly, weekly rental. The whole thing is heated with an outdoor wood boiler, keeping your winter heating costs to a minimum.